Text: Before the curtain drew up, there were catcalls whistling, which alarmed Johnson’s friends. The Prologue, which was written by himself in a manly strain, soothed the audience, and the play went off tolerably, till it came to the conclusion, when Mrs. Pritchard, the heroine of the piece, was to be strangled upon the stage, and was to speak two lines with the bowstring round her neck. The audience cried out “Murder! Murder!” She several times attempted to speak; but in vain. At last she was obliged to go off the stage alive. Comments: William Adams (1706/7-1789) was a Doctor of Divinity, Fellow and Master of Pembroke College, Oxford, and a friend of Samuel Johnson (1709-1784). Johnson’s play Irene was a classical verse tragedy set after the fall on Constantinople, in which the Sultan takes the Christian Irene as his mistress. The play was put on by David Garrick (who played Demetrius, a Greek nobleman) at Drury Lane on 6 February 1749, under the title Mahomet and Irene, with Hannah Pritchard playing Irene. 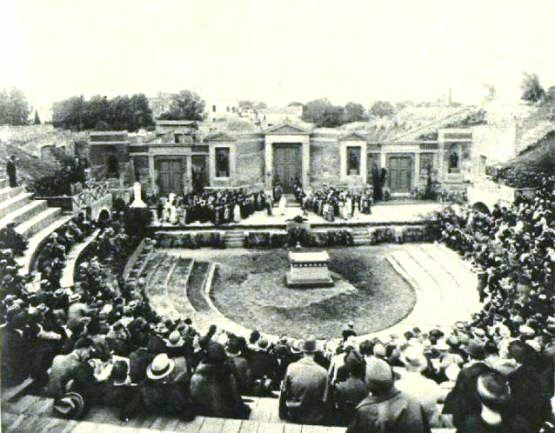 The play, which ran for nine performances despite some public displeasure, was a commercial success but an artistic failure. Adams’ impressions of the first night were given to James Boswell for his Life of Samuel Johnson. The play was subsequently altered so that Irene’s murder took place off stage. Impulse is founded, as its author, Mr. Stephenson, honestly informs us, upon a French piece. French pieces have their reason for existing in the state of society which they reflect and interpret. All people want to know life, above all the life which surrounds them and concerns them; and we come to the novel and to the stage-play to help us to what we want. French plays and French novels do undoubtedly render for French people the life which surrounds them. Those productions have this merit, at any rate. George Sand declares that Madame Bovary is not at all an immoral work, but, on the contrary, a useful one. Good and useful, after reading Madame Bovary in the family circle, Madame Sand and her family circle, so she tells us, judged this reading to be. But why? Because of the numberless Madame Bovarys, ‘les innombrables Madame Bovary en herbe’ at the present moment springing up everywhere throughout the provincial life of France, with their immense crop of ‘maris imbéciles’ and of ‘amants frivoles’ to attend them. That, says George Sand, is M. Flaubert’s defence for writing his book, and that is the reason for reading it that it holds the mirror up to French nature. Of course the same plea may even more confidently be urged for plays and novels rendering the life of Paris. They may be full of immoralities, but at any rate they hold the mirror up to nature, they do render the life of Paris. I am far from saying that I agree with Madame Sand that a book is good reading, even for grown men and women, because it faithfully represents actual life. It must have a quality in it besides to make it so. Manon Lescaut, which has this quality, is good reading; I would not say that Madame Bovary has the quality, or that it is good reading. All this, however, we need not discuss now. What is certain is that the French play, the French novel, render the actual life of the French. One may rate the work of M. Alexandre Dumas the younger, or of M. Sardou, as low as one pleases. One may even refuse to call it literature. Of course it is not literature as the comedy of Shakspeare [sic] and of Molière is literature; it is not even literature as the comedy of Beaumarchais and of Sheridan is literature; perhaps it is not to be called literature at all. But that it renders French life one cannot deny, and that the French public, wishing to see its life rendered, should follow with eagerness and pleasure this rendering, one cannot wonder. But Impulse – what life does it render? What does it say to all these wearers of attractive toilettes, to all these charming faces and figures, to all this ‘society’ a little wanting in soul and very much wanting in clear vision, which frequent it? Something half-true, factitious, and unmeaning. The English provinces really do not teem with ‘des innombrables Madame Bovary en herbe’: the most salient features of English society are really not the ‘mari imbécile’ and the ‘amant frivole.’ The ‘society’ news papers and their emancipated and brilliant staff may regret that the fact should be so, but so it is. Madame Bovarys, instead of being countless in our country neighbourhoods, are almost unknown there; the ‘amant frivole’ instead of being a stock element in our married life, is rare and unimportant. That fraction of our society for which the French play and novel are a rendering of its own life is so small as to be quite unimportant. This is proved, indeed, by the transformation the French play undergoes before the English playwright can present it to the charming faces, figures, and toilettes of our boxes and stalls. Virtue has to triumph; the ‘amant frivole’ has to come to grief. Ingenuous playwright! ingenuous ‘society’! Know this, as to your ‘amant’ as to your Victor de Riel: that, as your French guides would tell you, ‘c’est à prendre ou à laisser.’ Where he exists, where he is an institution, matters may well enough pass as they pass in the genuine French play; logic and experience are in favour of their so passing. Where he is an exotic, nothing can make him tolerable; defeated or triumphant, he equally makes the piece, of which he is the centre, unpleasant, makes it ridiculous. Comments: Matthew Arnold (1822-1888) was an English poet, critic and essayist. His ‘Letters of an Old Playgoer’, five short essay-reviews written 1882-1884 for The Pall Mall Gazette. Benjamin Charles Stephenson‘s play Impulse was based on the novel La Maison du mari by Xavier de Montépin. It was produced at the St. James’s Theatre in London, with Madge Kendal and William H. Kendal. The Latin phrase at the start of the article from from Thomas à Kempis’s The Imitation of Christ. Production: William Shakespeare, Cymbeline, unknown venue, London, April 1611? Text: Remember also the storri of Cymbalin king of England, in Lucius tyme, howe Lucius Cam from Octauus Cesar for Tribut, and being denied, after sent Lucius with a greate Arme of Souldiars who landed at Milford hauen, and Affter were vanquished by Cimbalin, and Lucius taken prisoner, and all by means of 3 outlawes, of the which 2 of them were the sonns of Cimbalim, stolen from him when they were but 2 yers old by an old man whom Cymbalin banished, and he kept them as his own sonns 20 yers with him in A cave. And howe (one) of them slewe Clotan, that was the quens sonn, goinge to Milford hauen to sek the loue of Innogen the kinges daughter, whom he had banished also for louinge his daughter, and howe the Italian that cam from her loue conveied him selfe into A Cheste, and said yt was a chest of plate sent from her loue & others, to be presented to the kinge. And in the depest of the night, she being aslepe, he opened the cheste, & cam forth of yt, And vewed her in her bed, and the markes of her body, & toke awai her braslet, & after Accused her of adultery to her loue, &c. And in thend howe he came with the Romains into England & was taken prisoner, and after Reueled to Innogen, Who had turned her self into mans apparrell & fled to mete her loue at Milford hauen, & chanchsed to fall on the Caue in the wodes wher her 2 brothers were, & howe by eating a sleping Dram they thought she had bin deed, & laid her in the wodes, & the body of Cloten by her, in her loues apparrell that he left behind him, & howe she was found by Lucius, &c.
Comments: Simon Forman (1552-1611) was an Elizabethan astrologer, whose manuscripts include the ‘Booke of Plaies‘ with Forman’s impressions of four plays that he saw in London 1610-11, three of which were productions of Shakespeare. Though some have argued that the document is a forgery, it is generally accepted as authentic. The date and location of the production of Cymbeline are not given by Forman, but its position in the manuscript between two dated productions suggest April 1611. Text: The other night I went to see Hamlet at the Girard avenue theater. I think it was Oct 22 1893. The first scene was where two men were on guard and they heard some one coming and said stand and unfold your self it was Marcellows you come most careful on your hour said the guards. They were not there long before Marcellows said look look what comes speak to it one of the guard said speak speak I pray you speak I charge you speak no it will not speak said Marcellows it is offended so the ghost went away. It was the finest ghost I ever saw. Then Marcellows and the guards went right to Hamlet’s house and told him all about what they had seen the night before. Hamlet said I will be there betwix eleven and twelve so the next night Hamlet was there when the clock struct twelve and then the ghost came in Hamlet said to it speak speak and the ghost turned around and made motions for Hamlet to come with it. Marcellows did not want Hamlet to go but he would and he followed it till it came to a certain spot where it stoped and said I am thy father spirit who was killed by my own brother. Doomed to walk the earth for a certain time but soft me thinks I smell the scent of the morning air I must away. 2 scene} Then Hamlet went back to the castle and was not there long before Ophilia’s father came in and Hamlet said to him have you not a daughter and the old man said he is harping on my daughter again. Ophilia came in and her father would not let her stay long but made her go away with him Hamlet was in love with her but she thought he did not love her but in a little while Ophilia came in again and Hamlet was talking to her when her father came and took her away. The next act was where Hamlet and his mother were in the room together and Hamlet told her to pray over his father and after that he showed her the picture of his father which he carried on a chain around his neck and said this was your husband and pointed to the picture on the wall and said this is your husband now and Hamlet thought the king was coming in the door so he drew his sword out and stabbed Ophilia’s father instead of the king after that Ophilla went crazy and very soon after drowned herself. The next act was church and grave yard the old grave diger was diging a grave Hamlet and Marcellows came and asked whose grave this is the old fellow said it is my grave Hamlet said I mean who is going to be hurried there A young lady said the old grave diger the old fellow dug a skull up out of the grave and Hamlet asked him whose it was the old fellow looked at it for a while and said it was David Garrick and Hamlet looked at it and showed it to Marcellows and then handed it back to the grave diger. The old fellow sings while he digs the grave in a little while the bell toles and the funeral comes in first six women carring the coffin and then her brother and the King and Queen and some others they open the lid of the coffin and look at her and close it again and the old grave diger lets the coffin down the hole the Queen throws a few flowers down in the grave Hamlet and Marcellows are hiding behind a tree and they see it all. I forgot to put in where Hamlet stabbes Ophilia’s father behind the bed curtains he thought it was the king. In a very little while the white light’s go out and they show blue light on the stage to represent night this made me nervious. While Hamlet and his mother are in the room the ghost comes in and Hamlet asks his mother wheather she sees it and she thinks he has gone crazy. I thought it was the best play I ever saw the ghost was a dandy and Creston Clarke played his part so very well and the scenery was very pretty. And another thing I forgot to say that Ophilia comes in the room where the king and Queen is with her hair hanging drown her back and with some flowers in her hand and she gets down on the floor and spreads flowers all around in a circle and after that gets up and goes out. Near the first act Hamlet and some others get up a play to scare the King. They play that a man was lying down a sleep in his garden and some one comes and pours some poisen liquid in his ear that kills him They do this to remind the King how he killed Hamlet’s father and so he gets scared and runs out and every body wonders what is the matter with him The last act was a scene in the palace the King and Queen was sitting on the throne and a good many others are around the King had fixed it up with Ophilia’s brother to be there to fight a duel with Hamlet so he took two cups and put some good wine in one cup and some poisen in the other cup so the time came for Hamlet and Ophilia’s brother to fight the duel and so they began. Hamlet got the best of him the first time and the King said I drink to Hamlet but he did not mean it so they commense again and Hamlet wounded him and so the King handed Hamlet the poisen cup to Hamlet but he would not take it and the Queen says I will drink to Hamlet and so she takes it and says Hamlet I am poisned, and Hamlet runs right up to the King and stabbed him And so the play of Hamlet ended. 1 think it was the best play that Shaksphere or any body else ever wrote. The dresses were very pretty but looked queer to me though I suppose that was the way they looked in Shakspere time. I think Shakspere must have been a very great man and writer to have thought out such a great play. I think it is just right I don’t think any body could improve this play. I hear that he has written a great many more good plays but I don’t think any of them could be a fine as HAMLET I hope I will see some more of his plays sometime soon. Comments: Jack Howiston (c.1882) was twelve-year-old boy living in Philadelphia when he wrote this account of having seen Hamlet in performance at the Girard Avenue Theatre, Philadelphia, on 22 October 1893. The introduction to this pamphlet (written by ‘S.A.B.’) states that he knew nothing of the play beforehand, and “for some days after the performance he amused and interested those of us in his family by reciting various passages, and illustrating the manner of the actors he had seen.” The family decided to publish his recollections privately, in this pamphlet, with spelling and punctuation unchanged. Creston Clarke, who played Hamlet, was a nephew of Edwin Booth.